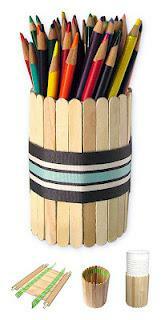 Popsicle sticks have a warm wooden, eco-friendly look and are inexpensive too. I’ve created a project that uses your average 15 oz. tin can as a base, and a removeable band of popsicle sticks. 1. I started with two thick wooden rulers and taped them down to a cardboard base. I left just enough space in between for a row of popsicle sticks to lie flat. I placed 25 sticks that were all touching side by side, and then glued down two fabric ribbons with some craft glue. 2. Let dry for about 15 minutes so that the sticks and ribbon are mostly bonded together. Carefully pick up the row of sticks with the ribbon and let dry for at least an hour. 3. One side of the ribbons gets trimmed flush with the stick edge, and the other is trimmed down to about an inch. Glue those ends to the inside of the opposite side and secure with a paper clip until it is dry. 4. Paint an empty, clean 15oz. can and let dry. The popsicle band should slide right over the can. A ribbon may be added for decoration. I like this one from the Martha Stewart collection found at Michael’s.